Last week’s North Star editorial about the limited land available for Parry Sound development and the the need to build up and in (Up is the New Out), rather than out, brought to mind a discussion that came up at an earlier public planning meeting organized by the town. The details of the meeting are beyond summarizing here, except to say that it was a very informative session regarding the issues facing Parry Sound as they relate to town planning and development. Two issues came up in the discussion that relate to the North Star editorial. Basically we’re stuck between rocks and rails. About the rocks. During the meeting it was explained that the town’s plan did not include near term development along Louisa Street. This was because of the considerable town expense involved in providing necessary water and sewage services (moving rock, blasting rock, drilling rock, etc.) to this area. This is a rather large section of undeveloped land, about 150 acres by my rough estimate, representing almost 5% of the total area of Parry Sound (about 3,300 acres). The other area off limits for development is north of Isabella Streets and west of the mall (see the map below). This is an area of about 250 acres of land (about 7.5% of the total town area), with Georgian Bay frontage, that is not available for development. The reason is the two rail lines, CN and CP, that cross this land and in effect cut off any reasonable access. 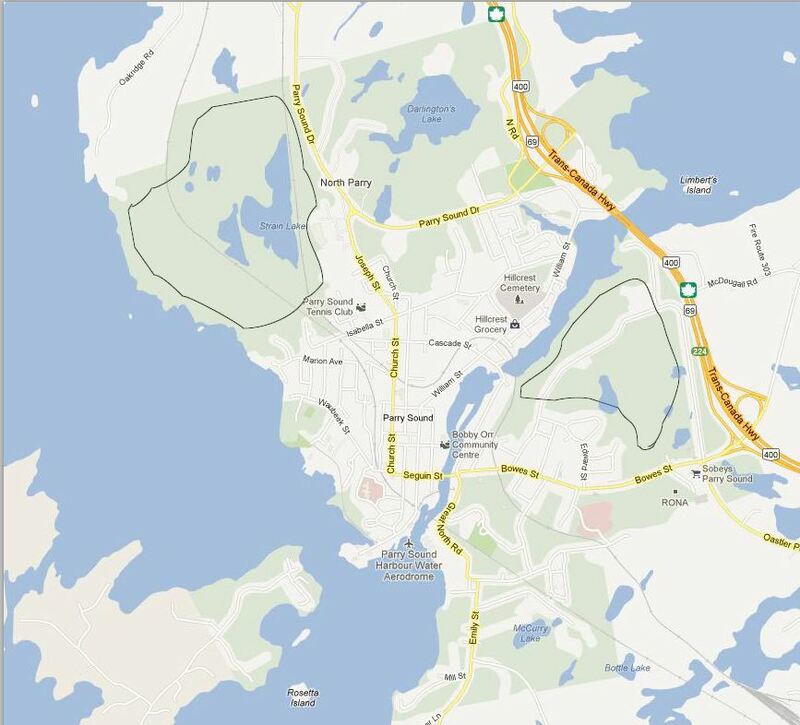 This is the area north of the Smelter Wharf, I’ll bet you never really realized it was part of Parry Sound. A limited portion of this area could be accessed from the Smelter Wharf, but the only way to access the larger portion would require a a road starting between the CN and CP lines as they cross Isabella Street. Yes, that’s a pretty narrow space, perhaps 100 feet. It’s not possible to imagine an intersection in this small space with the trains whizzing by. Alternatively, it would be possible to access this land by building crossings over the CP and CN rail lines off of Joseph Street and/or Parry Sound Drive. Between the cost of building the crossings (above grade, below grade, at grade? ), and the challenge of securing railway permissions and allowances, it seems this is not going to happen for decades. So as the North Star editorial noted we are looking at the prospect of more infill and taller buildings. This makes sense in too many ways to be criticized. But at some point we will need to think about developing the two areas mentioned earlier. In one case we have the necessary control, if not the financial resources to make it happen (Louisa Street). In the other we are not likely to see any development unless we can reach some sort of agreement with the railways. Stuck between rocks and rails the town’s prospects are still very good, even if challenging. Oh, for those of you who might be wondering; the railways together pay a total of $2,700 in annual property taxes (right of way privileges) for the right to run their trains through town and house their vehicles and equipment. The cost to the town is probably on the order of $3 million annually in terms of property taxes lost because of the undevelopable lands discussed above. And there is perhaps another couple of million lost to depressed property values because of the sound, smell and inconvenience of freight trains running through town day and night.